NO CHAIN. A 3 double bedroom property with both a modern bathroom and a modern shower room arranged over 3 floors. This property is accented by a number of internal architectural features and offers double sliding doors to the rear which open to a terraced rear garden. The front door opens into an entrance hall which features a striking, floor to ceiling glass window annexed to the kitchen/breakfast room. From the entrance hallway, stairs rise to the first floor landing, a door opens to the ground floor cloakroom with modern white suite and doors open to the principal ground floor rooms. Stripped wood floorboards extend from the entrance hallway through to the living/dining room. An impressive room, flooded with natural light architectural features include a double-glazed, partially vaulted ceiling with fitted blinds and a wall comprising floor to ceiling windows with double sliding door to rear courtyard style garden. The modern kitchen/ breakfast room has a window to front aspect and includes a range of wall and base units. Integral kitchen appliances include: a fridge freezer, oven and electric hob, a dishwasher and a washing machine. 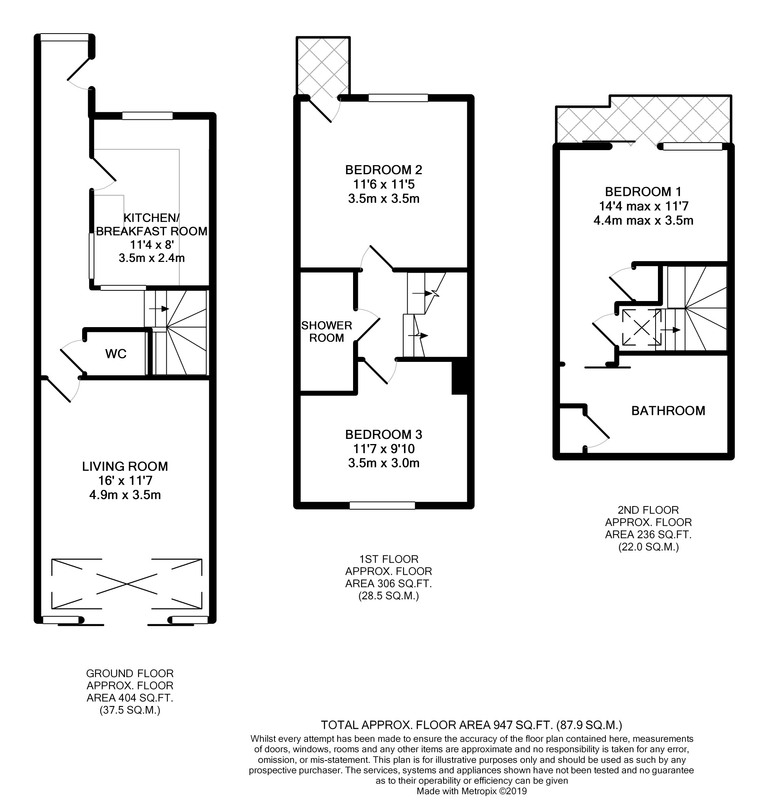 From the first-floor landing are doors to bedrooms 2 and 3 and a luxury modern shower room. Bedroom 2 has a double-glazed window to the front as well as a double glazed door providing access to a balcony from which there are obscured views to the south downs and over St Johns Street. Bedroom 3 has a double-glazed window to rear aspect with view over garden and roof-tops views to St Johns Church. Completing the first-floor accommodation is the luxury family shower room which is fitted with a Duravit suite comprising a wash hand basin, toilet and a good sized shower with glass screen door and rain style shower head and is also furnished with mosaic tiled walls and heated towel rail. Stairs continue from 1st floor landing to 2nd floor landing which has roof window and door to the 14ft (TBV) master bedroom suite which also features a floor to ceiling window to the side and sliding door which opens on to a balcony with far reaching views over the south downs. This bedroom has fitted cupboards and a glass pocket sliding door which opens to the en-suite bathroom. Again, this bathroom is fitted with a modern white suite by Duravit comprising bath, wash hand basin, toilet, tiled floor, 2 mosaic tiled walls and the airing cupboard. The rear courtyard garden is landscaped, enclosed by fenced and wall borders with gated rear access and incorporates a decked terrace adjacent to the house and steps that lead up to a brick laid patio. Included in the sale price is a wooden shed. Agents notes: Recessed spotlighting throughout. Double glazing throughout. GCH. EPC rating C. Street Scene of Cliffe High Street used within marketing material. This property is at the heart of the popular Pells area within walking distance of Lewes mainline railway station (London Victoria approx 1hr 10 minutes) and high street shopping facilities. Nestled within the South Downs National Park, Lewes is the County Town of East Sussex and Lewes mainline railway station offers a fast train service to London Victoria (approximately. 1hr 10 minutes). The A27 lies a short distance to the south of Lewes and provides fast access to the A23/M23, Gatwick Airport and the national motorway network. The coastal, business and entertainment city of Brighton & Hove is some 8 miles distant. 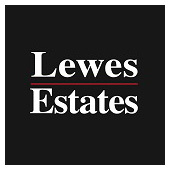 Lewes has an excellent range of amenities including an array of restaurants and recreational facilities, 3 prime supermarkets, caf	s, art galleries, shops and public houses. A farmer's market held the first weekend of every month. The internationally recognised Glyndebourne Opera House is located approx. 4 miles from Lewes. Lewes offers several highly regarded primary schools as well as Priory Secondary School, Sussex Downs College and Lewes Old Grammar School. Every care is taken in preparing our sales particulars and they are usually verified by the vendor. We do not guarantee appliances, electrical fittings, plumbing, etc; you must satisfy yourself that they operate correctly. Room sizes are approximate. Please do not use them to buy carpets or furniture. We cannot verify the tenure as we do not have access to the legal title. We cannot guarantee boundaries or rights of way. You must take the advice of your legal representative. With passion, unique marketing initiatives and the use of the latest technology we always strive to achieve the best possible price for your home. Every move we make is the beginning of something new, an exciting change. To be a part of that process is a highly rewarding experience.